There are lots of places to go ice fishing near Missoula, just be sure to bundle up! Ice fishing is a great way to get outside during the cold winter months. Just make sure to bundle up to keep yourself warm while you're out on the ice. Half way between Kalispell and Missoula (roughly a 120 mile distance), Flathead Lake is the largest natural body of fresh water west of the Mississippi River. The lake itself does not freeze, but bays lying along both western and eastern shores often freeze enough to successfully ice fish. Expect to find Lake & Whitefish Trout, Yellow Perch & Cutthroat Trout. Directions. A popular ice fishing location near Anaconda, MT (90 miles from Missoula, or an hour and 40 minutes by car) that has easy access, and only a short distance from the Discovery Basin Ski Area. Be looking for Salmon, Rainbow & Brook Trout. Directions. 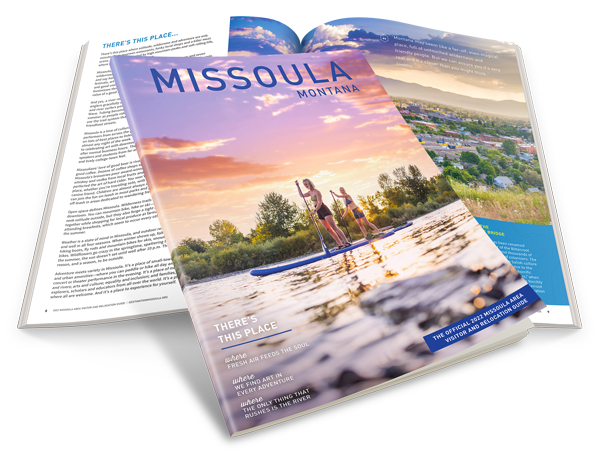 Among the many numerous lakes present in the Seeley Swan Valley are the highly popular Salmon, Holland & Placid Lakes that are an easy day trip from Missoula. Expect to find Bull Trout, Cutthroat Trout, Kokanee Salmon & Northern Pike. Directions. 2 lines with 2 hooks per line on all lakes and reservoirs open to fishing. When a line is used through the ice, the angler need not be in immediate control but must be in the vicinity and in visual contact with the line. In waters not open to spearing, the maximum size hole that may be used for ice fishing is 144 square inches or 12 inches in diameter. There is no size limit for a hole used for fishing with a spear. Definition/use: Any hut or enclosure constructed of any material, except ice or snow, for the purpose of ice fishing. Identification: Identification must be painted on or otherwise affixed to all unattended shelters in legible, 2-inch letters plainly visible at a distance of 100 feet. Identification must include the owner’s name and address, name and phone number, or 9/10-digit ALS number. Attended shelters at Brown’s Lake and Georgetown Lake must also be identified. Inspection: Each closed shelter shall have a door that an officer may readily open from the outside for inspection when it is occupied. Waste and rubbish disposal: Owners and occupants of shelters are required to keep their shelters (and the area immediately around them) free from rubbish and trash. Anglers must remove waste materials before they leave for the day. Removal after the season: The owner of an ice fishing shelter shall remove it from the ice before it becomes irretrievable at the end of the season, or within five days from receipt of notification from FWP to remove the shelter.